Kernos was delighted and extremely grateful recently to receive an award of £1000 from proceeds of the Bures Music Festival 2017, money which is being put towards funding therapeutic creative and play equipment for helping to treat Children and Young People. Clinical Director Chris Boatwright attended the awards evening in the Eight Bells in Bures on 28th September, where Jayne Crowley, on behalf of the organisers, presented her with a Certificate to display in the Centre. 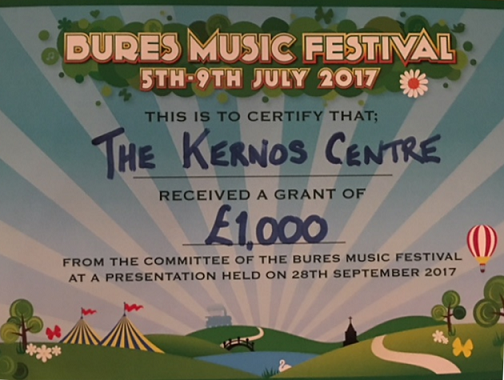 After receiving the Certificate, and thanking the organisers for their generosity, Chris reflected: “The Bures Music Festival grant will make a huge difference to the Kernos Centre. 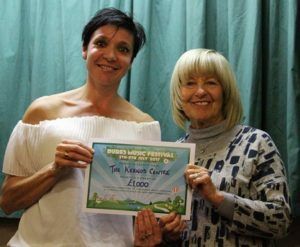 It will enable us to buy much needed play and creative therapy equipment. So many children and young people find that using such equipment makes it easier to express themselves and communicate at their own level.